On Shadowhunters Season 3 Episode 18, Simon realizes his feelings for Isabelle, Alec is given an ultimatum, and Clary succumbs to the darkness. Shadowhunters Review: Did Simon Make it Out Alive? 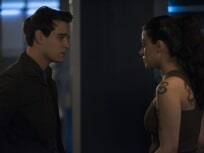 In order to get rid of Clary's twinning rune, Isabelle sends Simon into a secret facility as an undercover spy. Did he make it out alive? Read on to find out! Shadowhunters Review: Are Magnus' Powers Gone for Good? Clary attempts to summon Lilith and Alec is determined to save Magnus on Shadowhunters Season 3 Episode 16. Do they succeed? Read on to find out! On Shadowhunters Season 3 Episode 15, Alec, Maia, and Simon disagree on how to handle Heidi, and during a visit from Aline, Clary finally reaches her breaking point. Jace plans a special date for Clary on Shadowhunters Season 3 Episode 14. Will the happy couple get to enjoy a date night without any trouble? Read on to find out. The werewolf pack faces off against the New York vampire clan on Shadowhunters Season 3 Episode 13. How does it all go down? Read on for the details! Clary tries to break free of her capture in Paris on Shadowhunters Season 3 Episode 12. Will she escape Jonathan's hovering presence? Read on to find out. On Shadowhunters Season 3 Episode 11, the group deals with the loss of Clary. But could her disappearance mean the danger is far from over? Read on to find out. On Shadowhunters Season 3 Episode 9, a familiar foe threatens the lives of Simon's family. And, on Shadowhunters Season 3 Episode 10, the fight against Lilith begins. Isabelle and Alec dig deep into Jace's mind to potentially stop Lilith's control on Shadowhunters Season 3 Episode 8. Do they free him? Read on to find out. The group visits a familiar face about saving Jace on Shadowhunters Season 3 Episode 7. Will the ally be able to turn Jace back to normal? Read on to find out. Heidi has her long-awaited reunion with Simon on Shadowhunters Season 3 Episode 6. Does her sire welcome her with open arms? Read on to find out.